Years ago I walked through the doors of Scenic Hills Animal Hospital; I had no idea what this place would soon mean to me. I love St. Paul and the clients and pets we get the pleasure to work with daily. I live in St. Francis with my two children who are almost adults now. 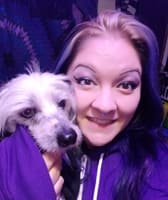 I have three rescue dogs Emmit a terrier mix, Boo-boo a Chinese crested and Sir Pringles crunch of chipington breed unknown. I also currently have one sphynx cat named Cedric von tiddlywink the 3rd. When I’m not at work I enjoy fishing, kayaking, walks and rock picking. I am a huge movie buff and really enjoy “The walking dead”. Very few people get to say they love what they do for a living, so I consider myself very blessed to get to do this job everyday. I graduated from Globe College in Woodbury in 2014 as a CVT. I have always loved being around animals-both small and large. I currently live in St. Paul with my husband and new baby. I now spend my free time watching my son learn new things. I have one dog, Remi, who loves coming to the clinic for a visit. The clinic here has become my second home. I love coming into work and spending time with my coworkers and clients here. 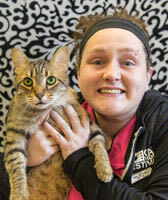 I am a Vet Tech at Scenic Hills Animal Hospital and I have been here since 2014. I started out volunteering for about a year and then got hired here. 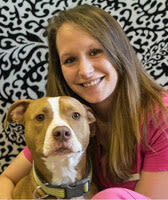 I love my job here at Scenic Hills, because I get to build great relationships with pets and clients. Nothing is more important to us than the pets and clients that walk through our door. I also love working with the staff here because they always know how to put a smile on your face. They are my second family and I am grateful to work with such great people. At home, I have a beautiful 5 year old daughter names Isabella. My daughter and my pets are my world. I have a gecko named Yoshi, 2 ball pythons named Slater and Hopper, a hedgehog named Dartanian and a bearded dragon named Lip. I am a huge animal lover and can’t wait to meet the pets and owners that walk into the clinic. I have been working here at Scenic Hills Since March of 2009. 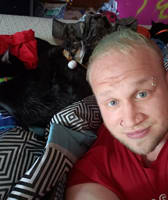 I recently purchased a home In Minneapolis with my spunky little black cat named Yoshi and my dog Pinot. I enjoy hanging out with my friends in my free time and I am a huge fan of music. I play the drums and enjoy watching sports like Hockey, Football and Baseball. I love playing video games such as “Call of Duty”. I also love any and all animals and am very passionate about my job here at Scenic Hills Animal Hospital. I have been a Vet Tech here at Scenic Hills since August of 2018. I am currently going to school at Argosy University to get my Certified Veterinary Technition degree. 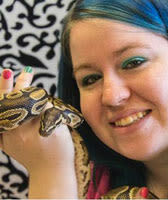 I have always had a love for animals and have known this is what I wanted to do since I was 5 yeasrs old. I live in Blaine, MN with my boyfriend and his family. I have 3 cats Apollo, Zelda, and their daughter Pearl also have a Leopard Gecko named Pascal. When I am not at work or in school I like to read Harry Potter books and watch the movies. I enjoy hiking,kayaking and fishing. It is so fun working in a place where I get to do something different with a different pet every day and meet new people. 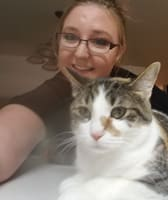 I have been a vet tech at Scenic hills animal hospital since May of 2018. I have been a technician going on 7 years and love every minute of it. I am currently in the process of getting my degree at Argosy university. I live in Circle Pines, with my 3 cats Raven, Salem, and Winifred Sanderson. When I am not working or at school I enjoy fishing, hiking and swimming. I love animals of all kinds but have a particular love for aquatic mammals, and hope to work with them someday. This clinic has become my second home, and I enjoy coming to work every day and taking care of pets the best I can! Linus has been with Scenic Hills for over 7 years now. His daily tasks include, but are not limited to, the following: Making sure the staff keeps his very strict treat schedule. Demanding fresh drips of water from the faucet every couple of hours. Greeting pets as they come into the back of the clinic. But mostly he keeps his eye on all of the staff to make sure they are doing the best job they possibly can. 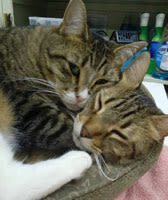 Sometimes being the boss of a Veterinary clinic can be lonely so that is where we found his lifelong girlfriend Tilly. Tilly came to us about 5 years ago. Her daily routine is dedicated to finding the most insanely comfortable place and relaxing most of the day away. She has recently decided that laser therapy is the greatest invention EVER!! These two amazing cats are very much a part of the Scenic Hills Animal Hospital team and love our clients as much as we do.